Our Pile of Dirt Hits a Growth Spurt! All I can say is, "Wow, that was fast!" 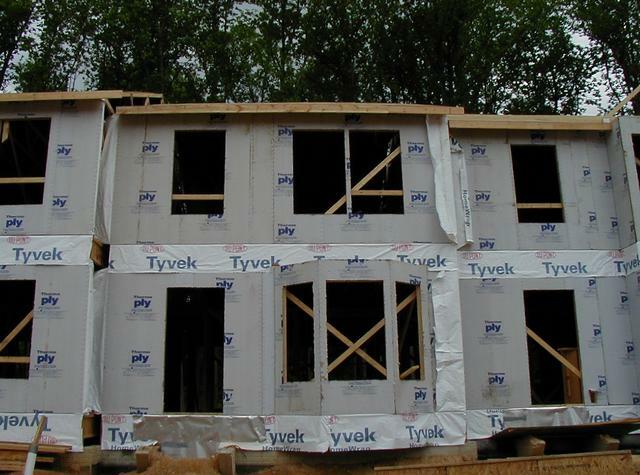 One week we were peering down into the foundation of our basement; the next week, we had a whole house! We are finally under roof! A vertical slice of our townhouse. For the very first time, I can actually say "Come on in!" While I cannot offer you any food or drink just yet (you will have to hold off until our house warming party for that), I can at least give an idea of how the inside of our house will be laid out. If good fences make good neighbors, then the same probably goes for interior walls. When Sarah first visited the site after the house had been framed, the inside mostly consisted of supporting boards and outlines of rooms. The stairs going downstairs were in place, but not the set going to the upper floor. 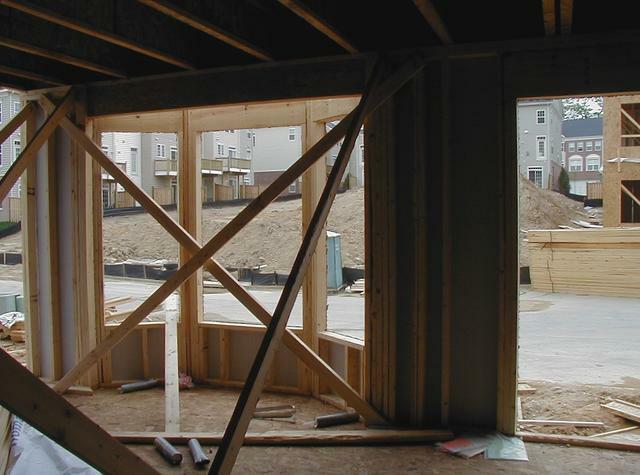 The very next week, almost all of the infrastructure had been put in place for both the rooms and the stairwells. For the next couple of weeks, I have no doubt that most of the activity will occur inside the house, as we watch each room come together. Our bay window will look out onto the little park across the street. The 'rents and our roommate, Chris, had a chance to visit the site. They were very excited about what they saw! All agreed, the house is set in an ideal location, looking out into a very plush woodland. I guess since we can actually call this a house now, they were our first guests. Don't worry though, there will be plenty of time to entertain all once we have a few more accomodations. The back of the house opens up to a stunning view of the woods. The day we visited the house, which was a Saturday, there was a lot of construction activity going on at the various lots, certainly a good sign. In fact, as we were leaving the site, one of the subs was working on the installation of the front door! 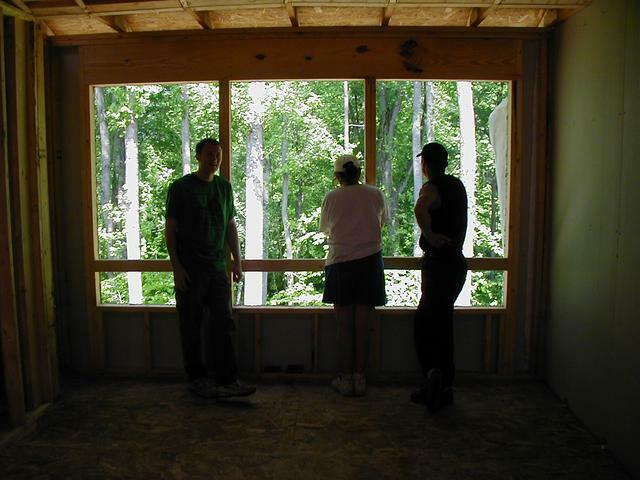 The front room was filled with windows and doors, so they should go on very soon. At this point the whole house resembles an unfinished basement, only missing some skin. 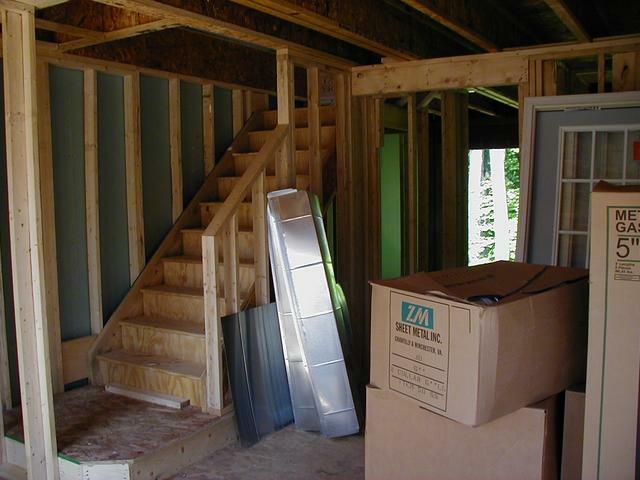 With both sets of stairs installed, we can get to every room in the house! Despite a very slow start, there is no question that our townhouse is now on the fast track to completion. Now that we can access every room in the house, it is possible to begin measuring out for furniture and brainstorm ideas on how to decorate the joint. 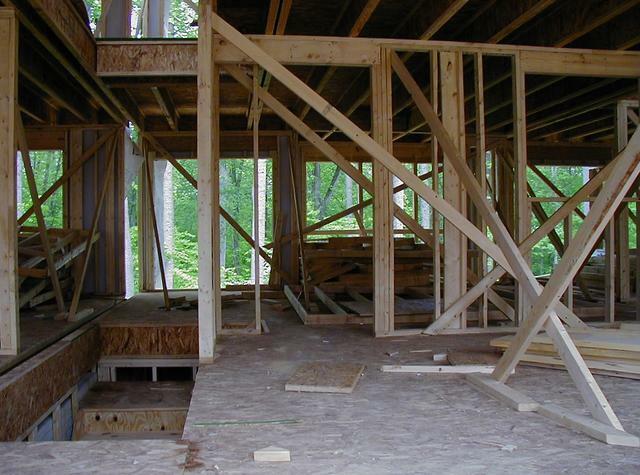 This phase was, by far, the most exciting of the house building process because we saw the house materialize from a vision to a physical structure of a house, equipped with stairs and all! Monumental enough for Professional Builder Magazine? We can dream.